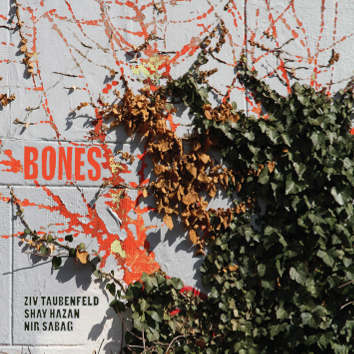 The Bones Trio consists of Ziv Taubenfeld on bass clarinet, Shay Hazan on double bass, and Nir Sabag on drums. This, their debut release for Leo Records, is a compelling and coherent album that can easily swing from exhilarating bop to more abstract modes of expression. Despite these oscillations, and despite the sometimes loose feel of the compositions, the members always maintain a keen rapport with one another. The first composition, “Under the Ab Tree,” foregoes accessibility or straightforward melodies, opting instead for a sumptuous shapelessness. The sounds they conjure up here are warm, inviting, but teasingly cryptic; the ultimate effect is that one is encouraged to keep listening, if only to find some key or clue. Luckily for us, the next piece, “Blue Key,” offers just that - a point-of-entry for those who might be disoriented by the relative formlessness of the opening track. In the opening section, the drums and bass are joined together in a rhythmic lockstep, but the piece soon develops in a different direction. There are excursions to unmapped areas: Hazan engages in an enthralling arco solo; Sabag produces loose, rolling waves of percussion. After these extended improvisations, they return to the initial theme and close out the composition. “Gold Wood” is distinguished by drummer Nir Sabag’s lengthy explorations in the middle. He starts restrained, with a steady and leaden beat, but gradually the pounding becomes louder and more vigorous. Soon, Hazan and Taubenfeld return and play the same motif with which they opened the piece. “Buses Chasing Pigeons” is rhythmically direct, Hazan providing a walking bass-line and Sabag propping everything up with an unwavering groove. Taubenfeld, on the other hand, careens manically from note to note; it does, in fact, sound like an audial representation of pigeons bolting. In “Egge,” he takes a similar route, but the tempo and note-density are intensified. Likewise, Sabag and Hazan here play with an exuberance that is positively invigorating after the relaxed pace of the previous piece. The closing composition, “Citrus Village,” revolves around a straightforward, tuneful theme, and everyone plays it relatively safe. It’s a nice way to conclude the album, and it plants a listenable seed in your mind that (in my case, at least) grows into a firm resolve to hear the album again. A note on the production: it’s fabulous! The sound is warm and spacious, and at times it feels like you are in the very room in which the album was recorded. If there had been any hint of tinniness or cool detachment on this thing, I feel that the entire endeavor would have suffered. Fortunately, that’s not the case. A wonderful release, and one that I can heartily recommend!